There is something exciting about the ability to assemble individual parts (DIY) to produce a new gadget. But one plus one does not necessarily equal two. GoPro, a leading international camera company has unveiled its latest 3D HERO System which enables the avid shutterbug to combine two 1080p HD Hero Cameras into a professional 1080p HD 3D Camera. This 3D expansion to the highly popular Hero cameras has caused much flutter for users can now combine several uses for their cameras. While more established as a consumer camera, GoPro’s HD 3D camera is increasingly being used by production professionals in film and broadcasting. 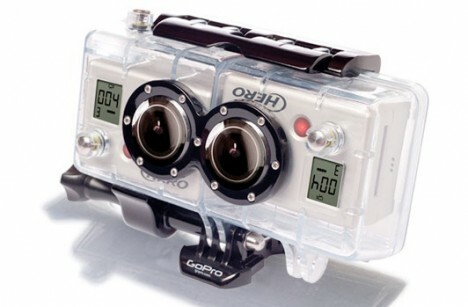 GoPro’s 3D camera can be mounted on gear, worn on the body or simply held in the hand. It shoots high quality images and is water-resistant up to 180 feet. Controlled by a single shutter button, a polycarbonate casing holds the two separate cameras together and link them with a synchronization cable. GoPro’s 3D system has pioneered an innovation which empowers users to make choices and have a camera with greater versatility.